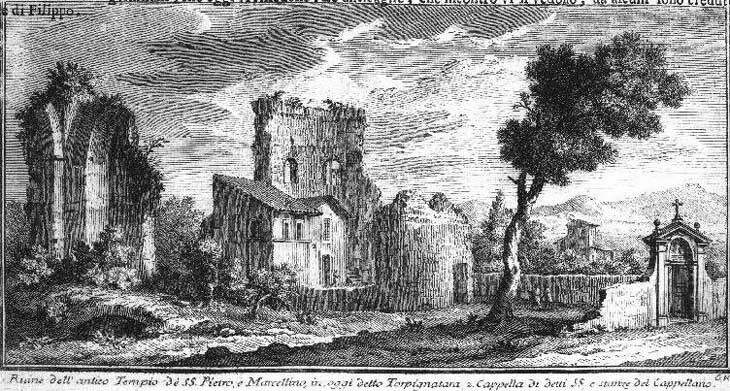 Giuseppe Vasi included a small etching showing a chapel built in 1638 by Pope Urban VIII in his 1753 book of views of the main basilicas of Rome; the chapel was built on the site where Sts. 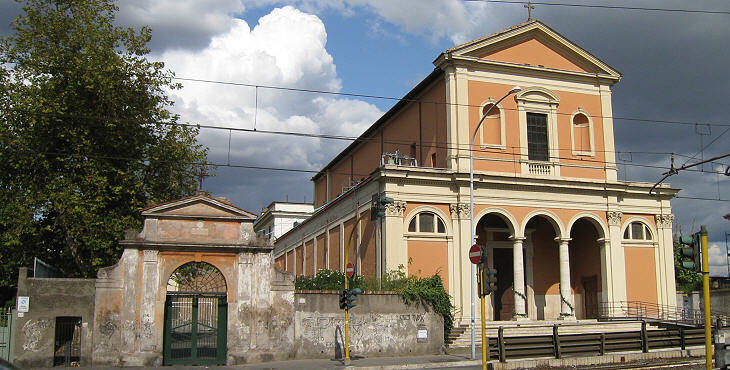 Peter and Marcellinus, two martyrs of the early IVth century, were beheaded and it was located three miles off Porta Maggiore along ancient Via Labicana (now Casilina), while a large church (shown by Vasi in the previous plate) was dedicated to them in Rome. 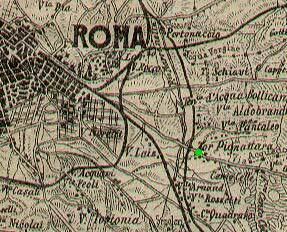 The chapel was surrounded by the imposing ruins of the Mausoleum of St. Helena (mother of Emperor Constantine) which were called Tor Pignattara, as shown in the 1911 small map here below. Today the area is densely populated and a large parish church was built next to the old chapel in 1922. The small portal depicted by Vasi is still there and it retains a dedicatory inscription (D.O.M. IN HONOREM SS. MM. MARCELLINI ET PETRI) which can be seen in the image which appears in the background of this page. The mausoleum was a large circular building with an octagonal interior decorated with niches. Similar to other ancient mausolea (e.g. Cecilia Metella, Sepolcro dei Plauti) during the Middle Ages it was turned into a fortification; this explains why it was called Tor (tower). 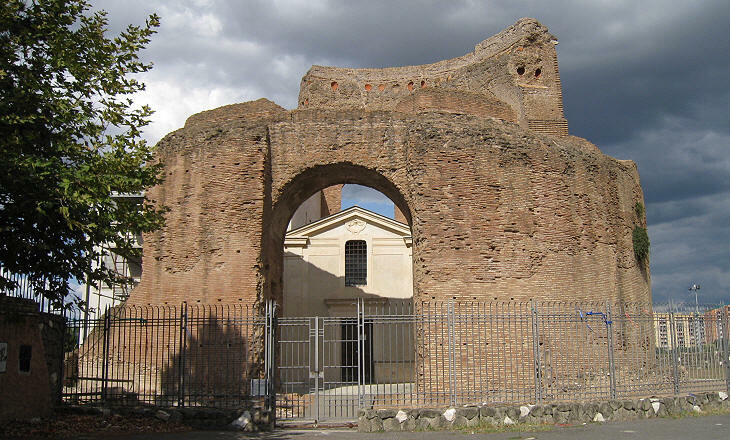 During the Late Empire Roman engineers lightened the weight of domes and vaults by placing empty vases inside their walls (this can be observed also in Circo di Romolo). The vases came to light when parts of the dome collapsed; because they were called pignatte in Old Italian the tower became known as Pignattara. The mausoleum was built next to extensive catacombs. 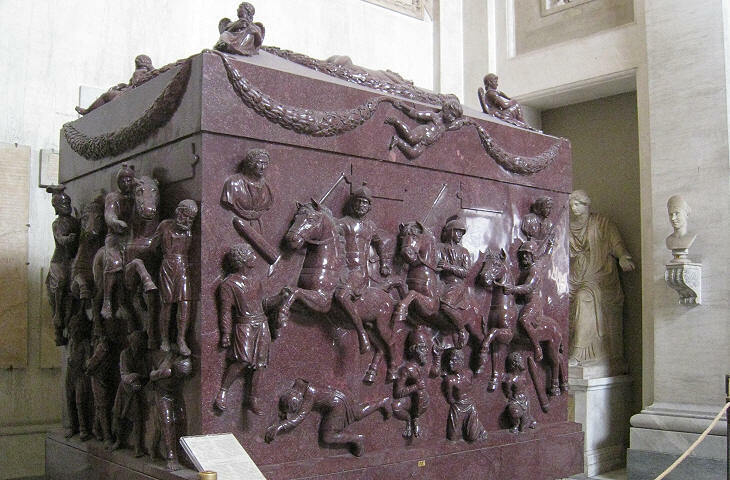 According to tradition the remains of St. Helena were brought to Constantinople two years after her death in 328; the porphyry sarcophagus which was found (with others) in the mausoleum was moved to the Lateran in the XIth century and eventually became part of the Vatican collection of antiquities; it does not have inscriptions and it is decorated with horsemen, prisoners and fallen soldiers; in order to explain this iconography which is unrelated to St. Helena, Christian writers have assumed that the sarcophagus was initially meant for Emperor Constantine himself.